The Air Max 1 keeps on getting colourway after colourway and remix after remix, though the recent Lunar1 seemed to strike a chord with an audience. 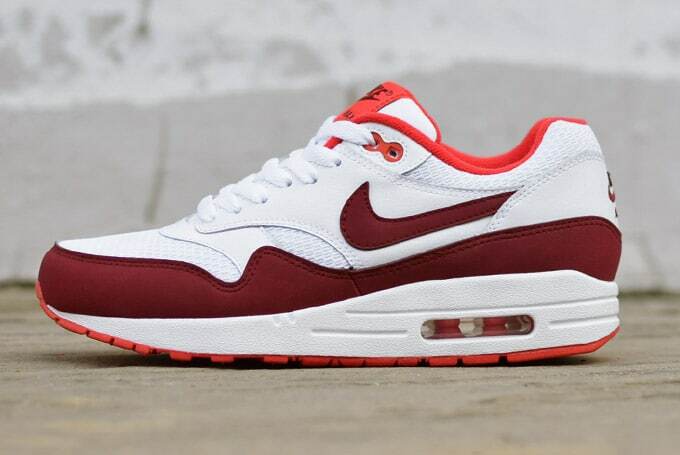 Maybe that’s because — in a world where classics like the AM1 have been given a wonky Swoosh here and there, with the shoe built for cushioning becoming a little chunky at the forefoot during the last decade —it looked more like an Air Max 1 than an actual Air Max 1. We get thoroughly bored of this design last year to the point where we just stopped caring about any version that wasn’t atmos-affiliated, because the quality and the shape had begun to border on bootleg. But with all eyes on the Huarache, we’ve warmed to Nike Air Max Essential colourways like this women’s version which, despite having some shape issues, brings burgundy to the upper and, if you’ve been keeping track of the site over the years, we really, really like that shade of red on our shoes. If this was on something with a slightly stealthier shape, we’d go bananas, because colouring that rand and leaving the mesh white is an undisputedly powerful combination, while the decision to sandwich the whole thing with an action red lining and outsole completes it. A decent women’s makeup that drops next month — some of the smaller footed gentlemen out there might be able to squeeze into a pair too.